Sony’s re-branding of the APS-C NEX mirrorless models as Alpha has presented an opportunity to realigned the range. Although the new A6000 announced in February this year features a 24-Mpix CMOS like the technically still current NEX-7 it is seen as a replacement to the newer NEX-6. Like that model it has dedicated on-chip phase-detection AF pixels (in addition to the usual contrast detection) although the A6000 can boast 179 AF points covering a greater area, up from 50-percent of the frame on the NEX-6 to just over 90-percent. The Exmor type 24-Mpix APS-C CMOS sensor is a development of the device used in the NEX-7 using a similar gapless micro-lens structure as that found on the 36-Mpix full-frame sensor used by the full-frame A7R. The latest Bionz X level processor allows AF with continuous shooting at up to 11 fps and ISO sensitivity to a maximum ISO 25,600 for stills or ISO 12,800 for movies. Like the NEX-6 and 7 it has a built-in EVF albeit with 0.39-inch lower resolution 1.44M dot OLED screen (down from 2.36M dot on the NEX-6) and a 3.0-inch 16:9 ratio, 921k-dot tilting LCD at the rear. Images can captured and shared using the on-board WiFi with NFC capability with suitably equipped smartphones. Some slight improvements in video over its predecessor include the adding of a zebra-pattern display capability to aid exposure control and an uncompressed 1080i/p AVCHD video at 24/ 50/60 fps via HDMI in addition to the usual in-camera capture option. The Sony Alpha A6000 is available in body only for $649 with a black or ‘titanium’ finish, or with the standard 16-50mm kit lens at around $799. 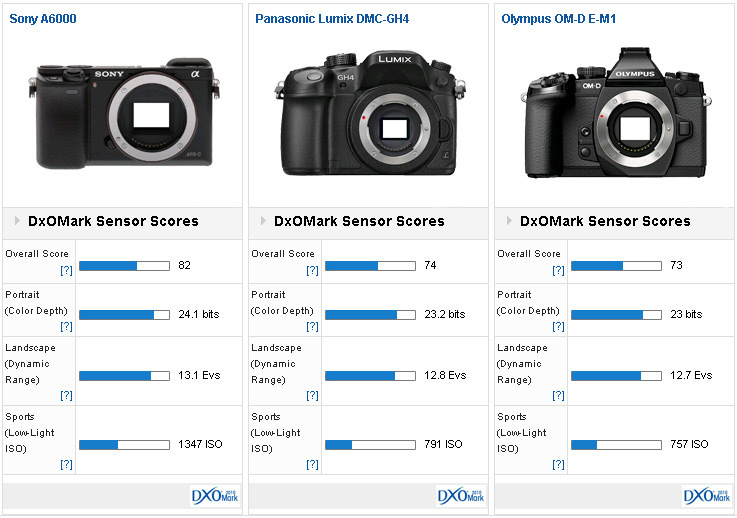 With a DxOMark score of 82 points the Sony A6000 sensor performance is very high, and on a par with the best performing APS-C sensors found on rival DSLRs. 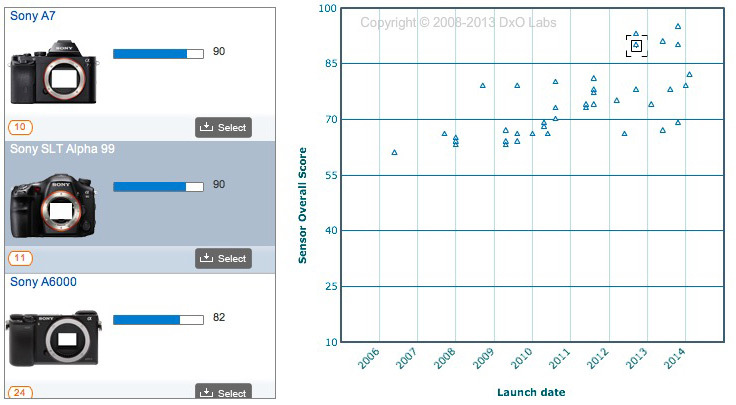 It’s ranked in 24th place overall however, it’s still some way behind full-frame sensors. 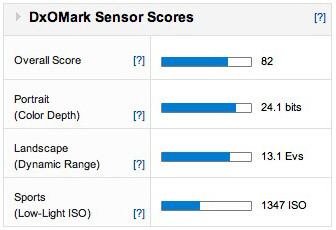 The 24-Mpix CMOS device in the firm’s SLT A99 and A7, for example, achieve a DxOMark sensor score of 90 points. Full frame sensors still have the edge in color discrimination, dynamic range, and low light capabilities especially but the A6000 sensor performs well overall. 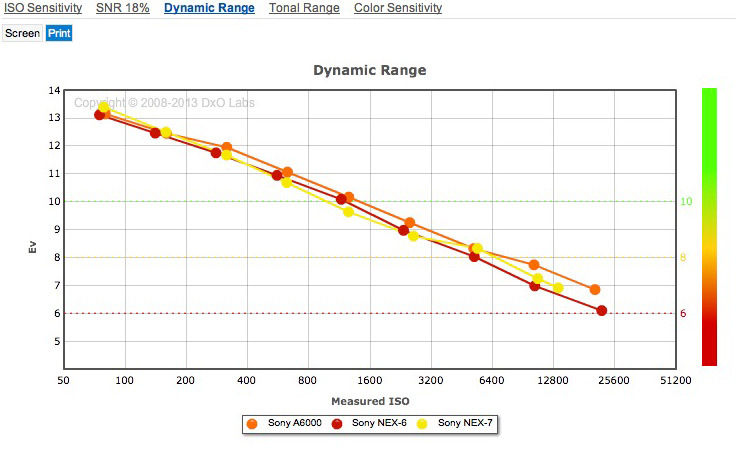 The A6000 sensor is ranked 24th overall and is placed in fifth position of the Sony cameras in our database. Pitched against its predecessor the 16-Mpix NEX-6 and the yet to be replaced 24-Mpix NEX-7 the new sensor has some incremental improvements in performance. 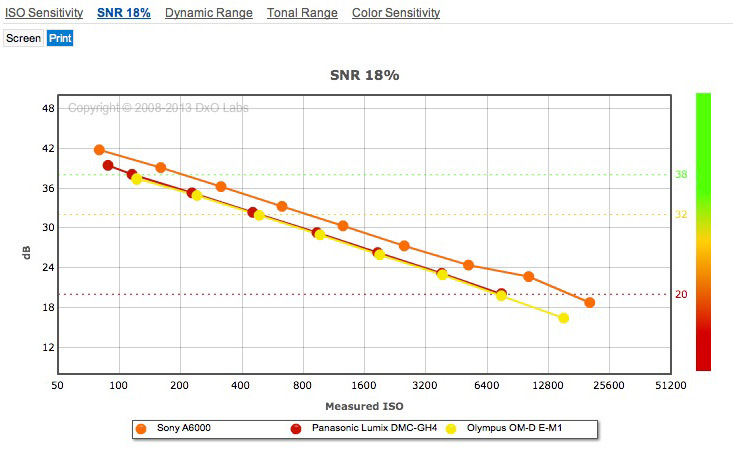 Color depth and dynamic range are close between the three – there’s only a marginal improvement in color sensitivity over the NEX-6 and a slight drop in DR at base against the NEX-7 (albeit that DR is improved at higher ISOs on the new model) and there’s a slight improvement in low-light performance of around a +1/3 of a stop. When compared alongside, similar high-end rivals from Panasonic and Olympus, albeit with a physically smaller sensor the A6000 has around a +2/3 stop advantage in sensor performance. It has +2/3 stop better color discrimination at base ISO but just +1/3 stop wider dynamic range. However, the A6000 has almost +1-stop advantage in low light over the OMD- EM1 and just over +2/3 stop gain over the new Panasonic Lumix GH-4. Although there are some slight advantages in color and DR, arguably the most important gain is in low-light (noise) performance. 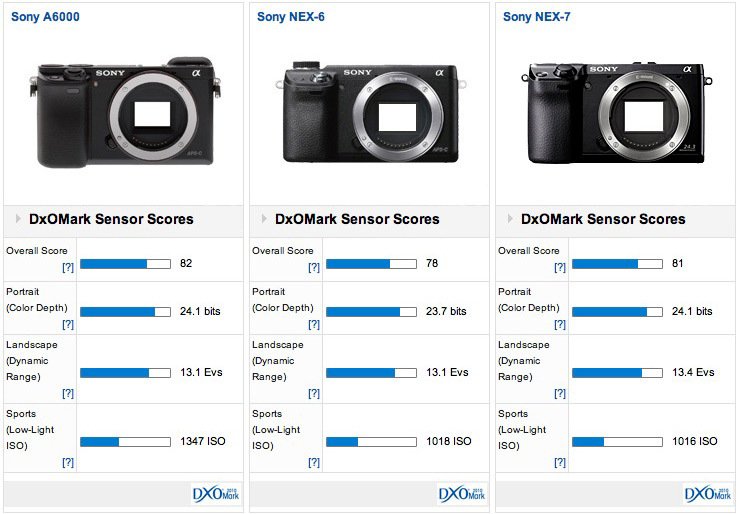 Sony’s re-alignment of the range with the new A6000 offering a better performing sensor than the NEX-7 in more –or-less an NEX-6 body is an intriguing development. When making comparisons, it’s always worth looking at the camera’s capabilities as a whole – for a start the reduced resolution of the viewfinder is somewhat disappointing. 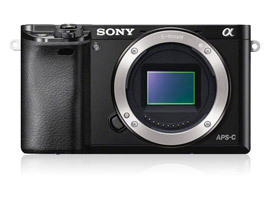 Based on sensor performance alone, however, at $649 (body only) the A6000 appears to be excellent value for money. And while we’ve yet to assess image quality with native mount lenses, the Sony A6000 certainly looks like a promising addition to the range.